We didn't get anything like the race anticipated. Indeed it was one back to front - literally. 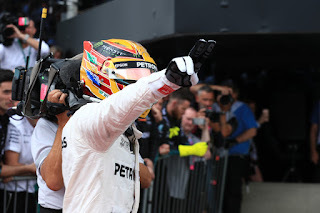 After a lap the chief world drivers' championship protagonist Lewis Hamilton was last and his one (albeit distant) contender Sebastian Vettel was second last. All due to a first complex contretemps. The title calculations therefore were re-done; Seb needed second to delay Lewis' title. He didn't get there, as he was never going to do without attrition or safety cars which never arrived. Lewis therefore confirmed the crown in odd circumstances, but it was no less deserved for that. And while all this was going on a certain Max Verstappen won, in a race of one.